It’s not often we fill requests in our adoption program but every once in a while we are able to make them happen. A nice couple had asked for two female black kittens. 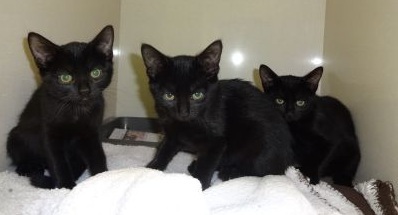 They knew how hard it was for black cats to find homes compared to other colors so when they were looking to expand their family they thought they would do so with a couple of harder to adopt kittens. Finding two black girls was a little harder than you’d think but after waiting for almost two months there was a mom and three kittens at Animal Services who desperately needed to be rescued. The complication is you aren’t allowed to just pull part of the family ….you have to make arrangements for everyone. One of our technicians put out a plee on a Rescue networking board on Facebook saying that if someone could find the space for mom and one of the babies The Cat Clinic had a home for two of them. This isn’t a normal practice, but since the whole family was black sometimes it makes it easier for a rescue to make the space if they can take just part of the family. Nikki from Pride Rescue agreed to help and arrangements were made to pick up the two girls the next afternoon. Then a bit of a miracle happened. Another of our long term clients had a cat who wasn’t adapting very well to being by himself after his long term companion had passed away. His owner decided she needed to try and get him a friend. The technician let her know we were heading to Animal Services that afternoon and could look for a suitable cat but did she have any preferences as to what we should be looking for. Her response was “I’d prefer a black kitten but whatever you think is best is fine.” We immediately contacted Pride and asked if we could take the third little girl. They were thrilled we found another black kitty a home so everything was set. We picked up Rose, Roseline and Rosalie later that afternoon. They stayed for three days for us to get everything set for their new families and just to make sure they hadn’t caught any respiratory infections during their stay at Animal Services. They have gone off to their new homes where everyone is doing great! We’d like to thank Pride Rescue for helping us arrange this adoption. Coincidently they named mom Ruby.